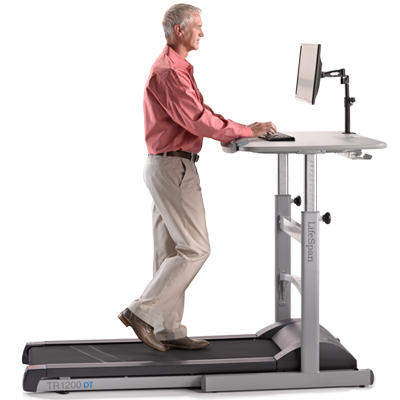 Buy LifeSpan TR1200 DT-5 Treadmill Desk - FREE SHIPPING! Intelli-Step - Intelli-Step™ step pedometer feature counts your steps while you walk. Intelli-Guard™ - automatically pauses the treadmill belt when you step off, mimimizing the risk of injury. Bluetooth - to support LifeSpan apps, which can be downloaded from the LifeSpan Fitness Club. Readouts - Distance, Speed, Weight, Steps, Calories & Time. Desktop Height Adjustment - Comfortably fits users from 4'10" to 6'8" tall. Even at the highest setting, this table will remain stable.